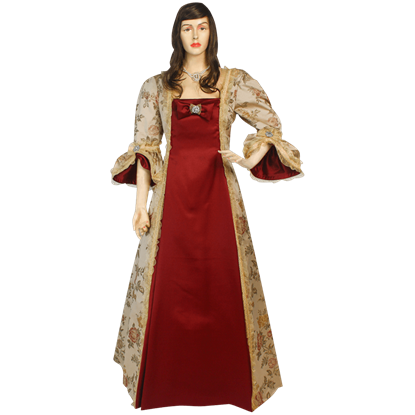 If you are looking for a line of Renaissance clothing that is fit for royalty, then you are in luck! 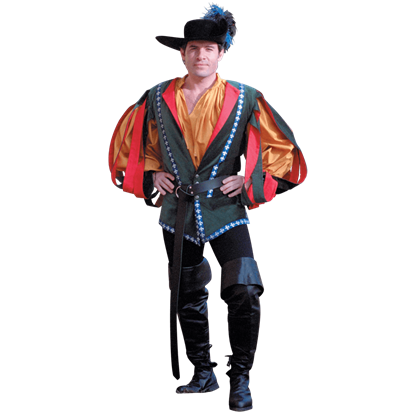 We carry Tudor clothing in historically accurate styles that are perfect for the Ren fair, costume parties, or theatrical performances. Our Tudor apparel includes pieces for kings and queens, such as designs inspired by figures like King Henry VIII, Queen Elizabeth I, and other members of the royal court. Some pieces are even inspired by the Showtime television series, The Tudors. 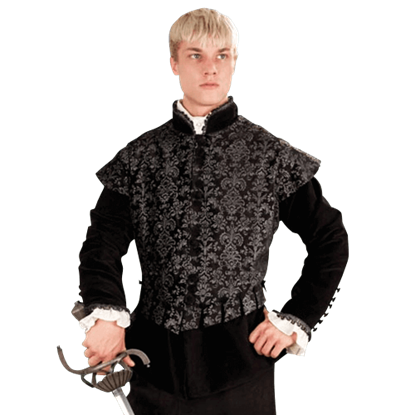 Each piece of Tudor attire is designed with comfort and ease of wear in mind. 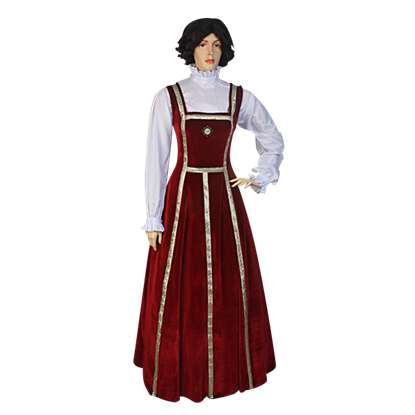 With items like Tudor gowns, Renaissance shirts, hosen, brocade trousers, velveteen robes, silk chemises, and royal doublets to choose from, you will be sure to find excellent pieces to finish your regal ensemble. During the 16th Century, as the Renaissance was spreading across Europe, plays known as comedias del arte began to gain popularity. Those days may be gone, but you can still look as lovely as a Columbina with the Comedia del Arte Gown. 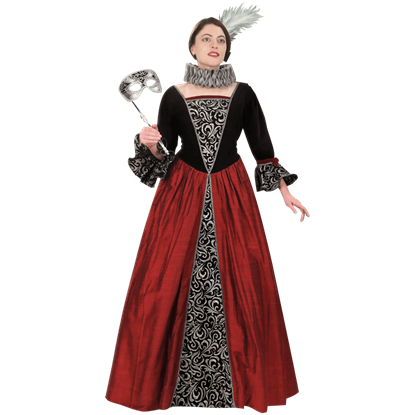 The Elegant Tudor Dress combines a beautiful cream colored floral pattern brocade with a deep red satin center. Unique sleeves and a lace-up back make this Renaissance dress a fantastic option for your next historic reenactment event. Sometimes, it is not the most ornate dress that is the most beautiful. Sometime, it is the most appropriate dress for the moment. 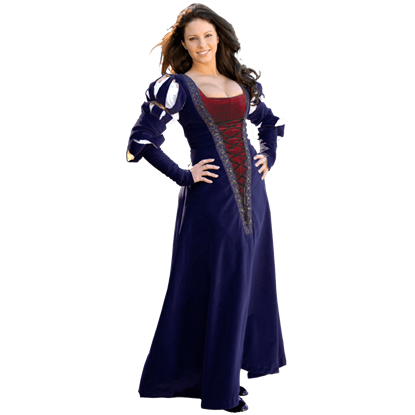 For those casual yet classy moments in reenactment, nothing serves better than this Elegant Tudor Dress. 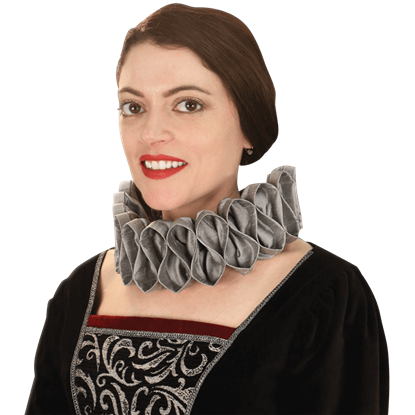 If you think of Tudor England, those puffy frill collars certainly come to mind. Originally made to enforce posture, they later became symbols of wealth. With the Elizabethan Ruff Collar, you can look just as regal without the stiffness. This c. 1525 gown is made of an outer gown of cotton velveteen lined in satin and an inset of cotton velveteen. The inset is worn over the Classic Chemise. The inset provides a lift for your bosom and holds in your tummy. 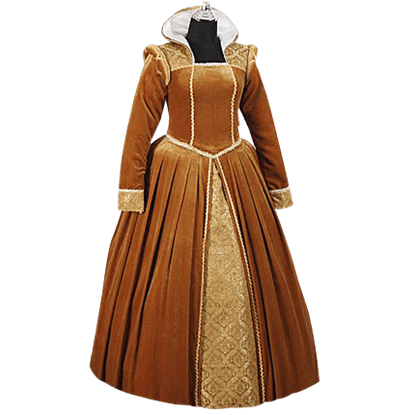 The Gold Velvet Renaissance Tudor Gown made from a golden high quality velvet fabric with baroque damask and fully lined. 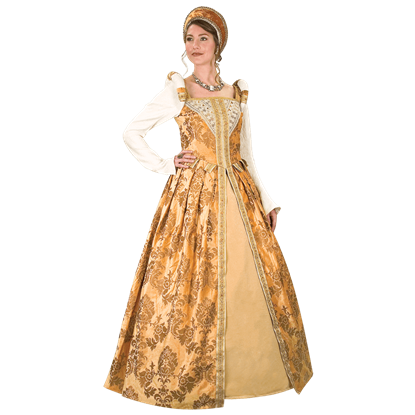 This Gold Velvet Renaissance Tudor Gown is great for Medieval Weddings, Renaissance Fairs and Medieval re-enactments. 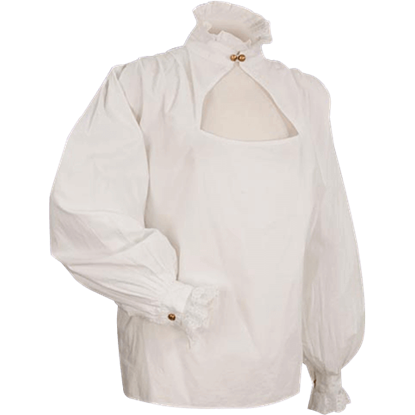 This high collared period blouse is manufactured in soft, white cotton. The open triangular front gives just a hint of seductiveness, while maintaining an air of modesty. It also has a lace trimmed cuffs with brass buttons. Watch any group of women drop what they are doing as a man in hosen walks by. Yes, women love a man in a pair of hosen! Our hosen are made of 92 percent cotton, 8 percent Lycra. The cotton breathes while the Lycra clings to your shape. This doublet is from paintings by Caravaggio, The Calling of St. Matthew and The Cardsharps. The trim makes your shoulders look broad and narrows your waist, and the slashed sleeves provide plenty of cavalier style!